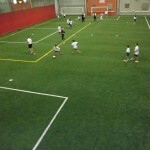 Soccer-Specific Training is one of the components of the Soccer Fitness Training Framework. Soccer-Specific Training is delivered through our On-Field Training and Power Running Series. Training sessions are delivered in 10-week programs, with 1 training session per week. Training can be continued throughout the entire 30-week soccer off-season from October to May, as well as the entire 20-week soccer in-season from May to September.. The program is periodized, and progresses from general to specific training, as well as from a low intensity/high volume, to a high intensity/low volume of training. The Soccer Fitness On-Field Training and Power Running Protocols comprise a comprehensive, soccer-specific strength and conditioning program, carried out on a field, incorporating exercise both with and without a ball. Exercises designed to raise the body’s temperature, and dynamically stretch and activate the major muscle groups used in soccer. Exercises teaching movement mechanics in all different directions, and with players competing against each other. Age-specific, and soccer-specific aerobic, speed, and plyometric training, designed to improve endurance, speed, reaction time, stride length and frequency, and explosiveness. Exercises designed to improve muscular strength and endurance in the abdominal and lower body muscle groups.